In this article, we will tell, how to remove Skype on different operating systems, as well as how to delete your profile Skype. Before deleting it is necessary to close the program, and not just get out of your account and minimize the window to tray, namely close. If you do not know, how to do it, It will help you get out of the article How to Skype. For removal of Skype in Windows you need to have administrator rights. If this is not a problem, then open the menu Start > Control Panel. Select Remove programs. In the resulting list, select Skype, click on it right mouse button and press the Menu Delete. The program will be deleted. In Linux also need to have access to the rights of the user ROOT. Go to section System > Administration and select the package manager Synaptic. In the window that opens, select Skype and press remove. The program is deleted. The easiest way to remove skype OS MAC - drag the program icon in the Shopping cart. Another way - you can use the application APP Cleaner. Completely delete your account in Skype must not. However, the system provides the ability to hide inactive accounts. If the account not used (the user does not leave the network) more than three days, it automatically locked and does not appear in the search for contacts. ie. 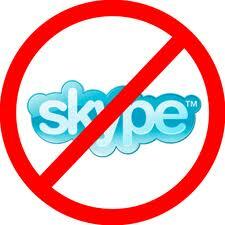 if you are already the fourth day you do not go to Skype, no one can find you through search.